As we reach the 10-year anniversary of the fateful day when Kevin “Wyckyd Freakyr” Saraceno walked into a Woolworth’s in Smackover, Arkansas, becoming the last person to purchase a new VCR, I invite you to take a gander through your media holdings. Sure, there are DVDs, MPEGs, and the obligatory reel of Basic Instinct you stole from your week as a projectionist. How many VHS tapes are still amongst your video collection(s)? Despite the superior video quality, plus the raw entertainment value of predicting which side is wide-screen and which side is crappy pan n’ scan, DVD has not completely eliminated the usefulness of the Rewindy One. And why is that, you (anyone?) are asking? From DVD’s boffo premiere (my first viewing within this medium was some small art-house flick called The Matrix) to its eventual demise as physical media marches towards a digital oblivion, many older films released in this format did not have their soundtrack accurately reproduced. Hence, for the true experience, you had to find the VHS (or Beta!) version. In 2002, with the resale market exploding online, I knew that I could grab a nice chunk of these films for a small price. Remembering the crappy quality of rented tapes, I researched the DVD releases of these films. Well, damn Sam – many were for sale, although as a new item, with that new item price. So I narrowed my list to a handful, and placed a few orders. Just one thing – I need to check IMDb.com’s reviews to see how big a wow-factor I should expect from all this awesome DVD technology. In addition, Where the Buffalo Roam was one of the only films on early-’80s mainstream cable that my parents did not allow me to watch. This always struck me as odd, because I sat through enough R-rated cinema by age seven to scare Focus on the Family into retreating back to even another century. (As Bart Simpson once said, “If you don’t watch the violence, you’ll never get desensitized to it.”) What Murray / Boyle hijinks would make Ma and Pa say “You know, we should only allow our son to see films like National Lampoon’s Vacation or The Best Little Whorehouse in Texas (which I saw three times in the theater!). This ‘Buffalo’ movie sure looks like whole lot of bad stuff!” So instead of getting to compare the “awesome” experience of the initial viewing with the let-down from watching said film as an adult (i.e. Thrashin’), I had 20+ years to build up ridiculously unrealistic expectations for a film that was wrought with problems from Day One of production. Isn’t life wonderful? Back to those IMDb reviewers – most were furious that the DVD version did not include the music from the original soundtrack. As someone equally obsessed with music as I am with movies, I also found this extremely frustrating. For many films, the DVD distributor did not obtain the rights for the music from the original release, resulting in bizarre choices of replacement tunes. For example, releases of Fast Times at Ridgemont High lacked Tom Petty’s “American Girl”, or most importantly, Oingo Boingo’s “Goodbye, Goodbye” during the closing montage (“Mr. Hand is convinced EVERYONE is on dope.”). Instead, we hear some weird tune called “That’s All There Is”, which I haven’t heard before or since. In the 2003 DVD version of Where The Buffalo Roam, the replacement songs are even more baffling. While Neil Young’s “Buffalo Stomp” and “Ode To Wild Bill #1-4” were deemed worthy of Universal Pictures’ money, significant moments in the film are compromised by the substitutions, such as Murray/HST boarding the press plane to some generic mid-’80s mall-pop tune, rather than Jimi Hendrix’s “Purple Haze”. (Jimi may seem like a cliché move for a lazy director, but there was a time when these fatally-overplayed classic rock tunes could summon great cinematic power – damn, I sound like a grumpy gamer deriding the scourge of “those kids with their ‘Magic’ cards”.) Instead of Bob Dylan’s “Highway 61” we get another generic mid-’80s mall-pop tune. Like Mitch Hedberg describing his vision for a McDonald’s that refuses to participate in any of the corporate offerings, “The Four Tops or the Temptations? NOPE! We got spaghetti!” (aka more generic mid-’80s mall-pop). Faced with this debacle of semi-epic proportions (let’s not exaggerate here), I altered my search for a vintage VHS version featuring “a typewriter on the cover”, as I was instructed. Paydirt! Now I can enjoy this occasionally-comedic quasi-effective recasting of Hunter’s wildest moments. Murray, as a free-spirit that viewed Thompson as a comrade in exposing untold stories to the world, is perfectly cast. While I like Depp’s portrayal in Fear and Loathing in Las Vegas, I prefer Murray’s naturalism to Officer Tom Hanson’s mania (apologies to our favorite highschool-infitrating, bowling-obsessed cop). Fear and Loathing is a better film, as Terry Gilliam has a gift for constructing scenes and moods, whereas Where the Buffalo Roam suffers from a disjointed vision and a too-many-cooks-in-the-kitchen screenplay. Murray, the subject matter, and the music are enough to carry his Hunter flick, but those who first viewed FaLiLV will undoubtedly find WTBR to lack the energy, wit or ethos of HST captured in the modern version (that’s right The Onion AV Club, we can turn film titles into nonsensical acronyms, too). Just kidding – I love you guys! 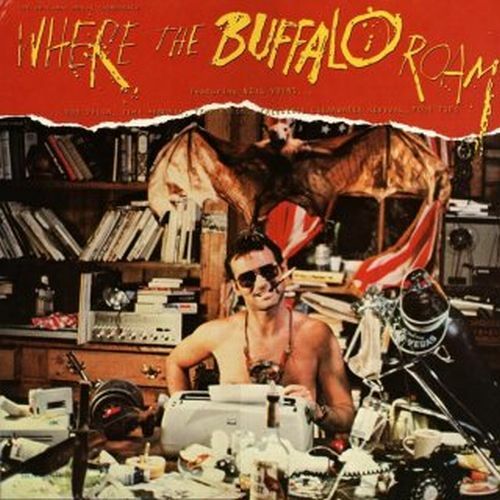 So do you in fact have a copy of Where the Buffalo Roam with the original music intact? I have een searching for such a copy in vain. I would be very interested in purchasing a DVD copy, even if it is a transfer from VHS. Please let me know if you have or could make such a copy that you would be willing to sell. Thanks!